Review: An ordinary English couple, Perry and Gail, are on holiday in Marrakech. 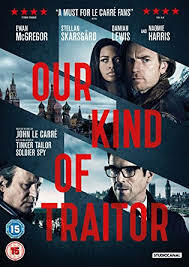 While on holiday they get caught up with the relationship between a Russian oligarch informant and the British Secret Service. They soon find that they cannot trust either side. Based on the best-selling novel by John le Carre. There have already been film adaptations of John le Carre’s books. One of them being The Constant Gardener (2005) and also Tinker Tailor Soldier Spy (2011). Great ensemble cast including the likes of Ewan McGregor and Naomi Harris. I just think it is a shame that Ewan McGregor hasn’t done much work over the last few years. Ralph Fiennes was originally cast but withdrew and Stellan Skarsgard took his place. I found it to be engaging and both gripping at the same time. Two producers worked on this film, Simon and Stephen Cornwell. They are both sons of John le Carre whose real name is David Cornwell. This picture was partially filmed in and around Arsenal FC’s Emirates stadium. The movie is set in five key settings: London, England; Marrakech (aka Marrakesh), Morocco; Bern (aka Berne), Switzerland; and Paris & the French Alps, both in France. The last thing I want to say is look out for Christian Brassington’s (Ossie Whitworth) cameo from t.v. series Poldark 2017! !